In front of an announced crowd of 39,476 (still looking to see if this is a troll), the Florida Gators inched close to a 100 offensive points as the Orange team defeated the Blue team 60-35. 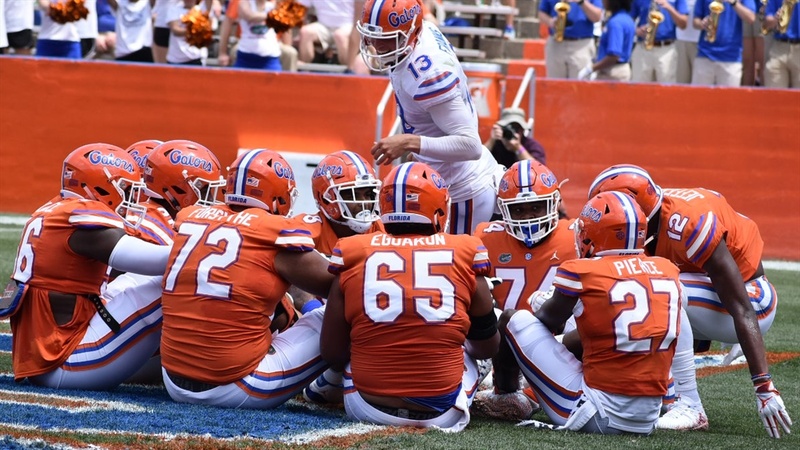 There were former Gators who helped out, some wrinkles to keep the crown cheering and a look at what the veterans can do in a second season under head coach Dan Mullen and staff. Thumbs Up: From the first play of the game, the tone was set when Feleipe Franks handed off to C.J. Henderson (in at receiver, because why not); Hendo flipped it to Kadarius Toney and the former high school quarterback sent it 40-yards on a rope to a waiting Franks. Mullen said on Monday that a spring game meant no one was leaving the stadium upset. That rang true as fans stayed, even on a hot day, to meet players, get autographs and just stay in the atmosphere created. There were touchdown celebrations, guys cutting up and smiles as they let loose after a long spring. That’s not to say everything was scripted though. We saw good separation from the receivers, some really nice touches from the quarterbacks and the sense of competition Mullen ask for even on a day when the offense was obviously set up to perform well and the second half featured a running clock. Thumbs Down: As mentioned, the defense was purposely playing off a little bit to save bodies, but there’s only so much the defensive line could hold off against a young offensive line. With the lack of experience there was no variation of the offensive line that was going to be stout. And there’s cautious optimism that they’re progressing at a good pace and will be in a decent spot by August 24. But Saturday was still a stark reminder that there is a serious lack of push from the line currently. The running game was forced to be nearly non-existant as such and the quarterbacks were often found scrambling; silver lining there could be the passers are getting experience facing lots of rush. The line was able to hold long enough to give Feleipe Franks time but has to take steps this offseason. The incumbent quarterback silenced any doubt that he was the clear starter with a performance that was crisp, smart and even explosive several times. His only real mistake came on a designed interception for former Gator Lito Sheppard. Franks finished 13-17 for 357 yards and 4 touchdowns through the air, adding another touchdown on the ground. After the rushing touchdown he stopped in front of the crowd and did a dance, putting an exclamation point on a spring that has all but named him the leader. What a day for the junior receiver. He’s always shown glimpses of incredible talent and this spring has seen him really start to put his game together. He put up 195 yards and three touchdowns, several of those coming on 60+ yard receptions where he slipped behind the defense and beat them out with pure speed. Grimes told reporters afterwards that he feels like he’s overcame a lot of mental blocks the last few months & the new Grimes could be a real problem for oppenants. The Gators do-it all guy made his presence known from the opening snap when the former quarterback launched it 40-yards to Franks. He ended the drive catching a pass in the corner of the endzone for the game’s first score. He danced around defensive backs and cut them off downfield for big gains. He’s arguably the Gators most electric player and when he’s on his game he’s mesmerizing. He ended with four receptions for 94 yards and the touchdown. Every practice, Saturday’s game included, has us leaving and wondering why we don’t talk more about John Huggins. On his first drive he read a Kyle Trask pass perfectly, jumping Freddie aswain to return it for an 80-yard touchdown. He’s a smart player that wins a battle with his mind. He finished with two tackles with one for a loss, a pass breakup and the interception. The Louisville transfer has seemingly locked up the BUCK position and erased doubt on Saturday. He is quick off the edge and has impressive moves that put him into the backfield for officially one sack but it was more disguised in the lazzies faire defensive rules of a spring game. He introduced freshman Michael Tarquin to the college game with a spin move that easily made him a problem for Emory Jones. Tre Grimes used that 195-yard performance to set a new Orange and Blue Game record, passing Dallas Baker’s 2004 176 yards which had stood for the past 15 years…Freshman QB Jalon Jones didn’t appear until the 3rd quarter was almost over but proceeded to take it for a 34-yard rushing gain…Jacob Copeland was not dressed out…We got several apperances from former Gators, the list including Janoris Jenkins and Mike and Maurkice Pouncey among others. But the highlights were the cameo’s. The first came from Lito Sheppard, the former early 2000’s defensive back who “intercepted” Feleipe Franks and scored on a 36-yard Pick 6. The other came when Nick Sproles went deep to former ‘90’s wide receiver Chris Doering who walked in for the touchdown. It was a reminder that Mullen wants this program to not only be about who’s here but who’s come before, keeping them involved and doing it all with a sense of fun...the celebrations were plenty, including a free-throw line reenactment from Tyrie Cleveland (2TDs, 4 receptions, 74 yards), Freddie Swain (2TDs, 5 receptions, 115 yards) punting the ball into the stands and a game of duck-duck-goose between the Orange offense.